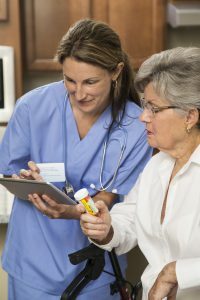 What is at-home hospice care? Are you, or your loved one, among the 7 out of 10 people who would prefer to die at home? Ruby Coles was, and her hospice team helped her fulfill that wish. Ruby Coles’ smile would light up the room as she greeted visitors to her Delran, NJ home. Visits throughout the week, she said, from “all the nice people from hospice” insured that she was never lonely. Ruby not only relished their company; she appreciated their expert care that allowed her to preserve her cherished independence. “I like the neighborhood I live in and would hate to be a burden to my children,” she explained. Those “nice people” included a full team of experts: a board certified hospice-palliative physician and the hospice nurse “who takes my blood pressure, orders my meds, and asks me 50,000 questions each time she’s here about how I’m doing,” Ruby said with a twinkle in her eye. Other team members included a spiritual support chaplain, and her home health aide who helped her with light housework and changing the bed linens. 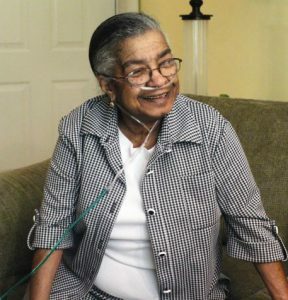 Ruby’s social worker took on the burdensome inquiries into several outstanding pre-hospice medical bills, and her electricity bill that had risen drastically due to her medical need for air-conditioning and oxygen. “She was able to get me credits, discounts or a payment plan on these matters that just took the worry right off my shoulders,” she said. Is Home Hospice Care Right for You? Right up until her passing, Ruby and her hospice team worked together to keep her comfortable and safe at home where she wanted to be. Hospice care is a choice. Choosing hospice care supports you or your loved one’s desire to spend the end of life in the comfort of home surrounded by family, friends, pets, and familiar belongings. However, the experience of receiving hospice care at home is still not familiar to many people. The fact is, once people overcome their fear of the unknown and benefit from hospice firsthand, they often wish they’d called sooner. Ruby’s pulmonologist recommended hospice care when her advanced lung condition made her unable to withstand surgeries for a heart blockage and kidney stones. 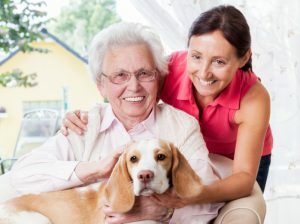 At-home hospice care provides care focused on comfort rather than cure when a doctor estimates that your life expectancy is six months or less if your illness follows its normal course. Hospice care is available where you or your loved one lives — your home, the home of a relative, or your assisted living or nursing home community. Should your pain or symptoms need a more intense level of care, your at-home hospice team may recommend a short-term transfer to an inpatient hospice center. Hospice offers a team-oriented approach to expert medical care, pain management, and emotional and spiritual support expressly tailored to you and your family’s needs and wishes. In addition to the team, each patient receives related medical equipment, supplies, and medications for maximum comfort and quality of life. Remain in familiar surroundings. When you use in-home hospice, you can sit on your own couch and use your own bathroom. When living with serious illness, or caring for someone who is, the comforts of home are priceless. Spend quality time together. Creating additional memories and sharing feelings, emotions, and the words that need to be said are important during this time. At home, there will be more opportunities for conversation, memory-making projects, and other bonding activities that feel right and matter most to you and your family. Receive expert care by trained professionals. Hospice addresses your physical, emotional, social, and spiritual needs as defined by you and your family. The goal is to provide the best possible quality of life for your or your loved one. The key to providing such support is using a diverse team of professionals who address all aspects of your needs. The team consists of physicians, nurses, social workers, spiritual support counselors, health care aides, volunteers for respite and companionship, and more. Each member is trained to provide comforting, end-of-life care. Frank lived alone. His hospice social worker connected him with a local non-profit that will deliver him hot meals a few times a week. Depend on regular visits. Members of the hospice team will visit you and your family regularly depending on patient and family needs. Without the upheaval of unplanned trips to the emergency room or re-admissions to the hospital, you and your family can create a schedule and a care plan that is less taxing physically and emotionally. Avoid calling 911. Families are relieved to discover they can get help during a crisis by calling the hospice-care organization at any time of day or night. There’s great peace of mind knowing that someone is available to talk to 24 hours a day, seven days a week. If an urgent problem can’t be resolved over the phone, a nurse will visit. There is no need to call 911 or visit the emergency room. Sandy was frantic when her husband was calling out in pain at 12:30 am. So she called her hospice’s (800) # . The On-Call Nurse was able to walk her through the steps to make him more comfortable. Receive expert explanations. The members of your in-home hospice team are experts in end-of-life care. With each visit or phone call, you’ll get answers to all your questions and to the questions you didn’t even know to ask. They will guide you through care giving, support your emotions, prepare you for what to expect next, help with explaining to children in age-appropriate ways what is happening within the family, assist with delicate family dynamics, and offer guidance on planning funeral arrangements and meaningful memorial services – just to name a few. Maintain their loved one’s dignity. Hospice regards a natural death as part of the circle of life. Hospice helps you or your loved one LIVE your final months and moments with dignity. You are not spending precious days in the Emergency Department or Intensive Care Unit. You are not constantly poked and prodded by medical staff; and you won’t undergo invasive procedures or aggressive treatments that may no longer be effective in extending your life. You are kept clean, comfortable, and as pain-free as possible. David always looked forward to the certified home health aide visits. He knew his mom appreciated the delicate bath and attention to her hair. The home health aide always made his mom feel so comfortable. Use coverage by Medicaid, Medicare, the VA, and private insurance. Medical bills at the end of life can be overwhelming for many families. When your loved one is on hospice care, however, your out-of-pocket costs can be covered in full or significantly reduced. Medicare, Medicaid, the VA, and most commercial insurance plans include hospice benefits. It’s a good idea to check with your insurance provider – before your family is in crisis – to find out the extent of your hospice coverage. In addition, many hospices will not turn away a medically eligible patient for lack of financial means or coverage. Get medical equipment, supplies, and medications delivered to your door. Whether it’s a hospital bed, oxygen, medical supplies, or medications related to your hospice illness, they’ll be delivered to your door step at no charge by your hospice. This frees you from the time and stress of researching reputable providers, placing orders, or running additional errands for these important items. Receive home health aide care. To the relief of many overburdened family caregivers, in-home hospice care includes visits by certified home health aides (CHHA). 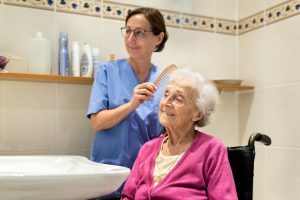 The CHHA helps with personal care like bathing, shaving, and light meal preparation for the patient. The CHHA can also help instruct family members on care tips to keep their loved one comfortable. This personal care, provided with dignity, is a much appreciated service in the privacy of your own home. Request volunteer visits. The hospice team includes a trained volunteer available for companionship, chatting, reading, playing cards, story sharing, etc. This compassionate visitor can provide joy for the patient and a much needed respite for family caregivers. Personalize their support. Hospice focuses on your individual needs and choices, providing everything from companionship, to spiritual support, to realizing possible wishes and dreams. Hospice enables you and your family to spend each day focusing on what matters most to you. Betty’s wish was to make sure her family and friends enjoyed her funeral. With the help of her hospice social worker, Betty gained great satisfaction planning a celebration-of-life party that included martinis and a few of her favorite finger foods. Receive family support during and after a loved one’s illness. Hospice helps families cope with this difficult time, offering counseling by social workers and chaplains. After the loss of your loved one, we’re still here for you. Check with your hospice of choice regarding its program of bereavement services. Many help guide families in completing the tasks that are necessary immediately after death; others offer individual grief counseling or grief-specific support groups and other helpful resources. Kathy had a hard time dealing with the loss of her mother. She was grateful for her social worker’s follow-up calls and counseling sessions that gave her the tools to cope better with going back to work. Anna was at a crossroads last summer. The cheerful 80-year-old was hospitalized with severe medical challenges that required difficult decisions about her future. But thanks to extensive support from hospice, Anna is now living comfortably with close relatives, enjoying each day with family and friends. Although disabled by a major stroke and unable to walk for the past 20 years, Anna has remained a “joyous, happy person,” notes daughter Marie Ann. Then last June, the great-grandmother could no longer swallow food safely– without some of it passing into her lungs. The family prepared to watch their beloved mother and grandmother spend her remaining days in hospital rooms. She and her family soon learned the truth: that hospice is really about how best to live with a serious or terminal condition. A hospice team member met with the family in Anna’s hospital room, and immediately began connecting them with the supports they would need to care for Anna safely in the home of her son and daughter- in-law, Pete and Nora. Samaritan aides visit their home to bathe and dress Anna, transfer her from bed to chair, change her bed linens, bring healthcare supplies, and enable Nora to take breaks from caregiving. A hospice nurse visits regularly to check Anna’s health and well-being. And volunteers are available to provide companionship by phone or in person. “We appreciate the one-on-one personal care,” says Marie Ann, the youngest of Anna’s five children. “Mom loves the staff. Sometimes the toughest thing is making the decision to call for hospice help. That’s why hospices try to keep the process as seamless as possible for you. You may call your chosen hospice to see if you meet the hospice eligibility requirements, or you may discuss your readiness for hospice care with your family physician or specialist who can phone in the referral. 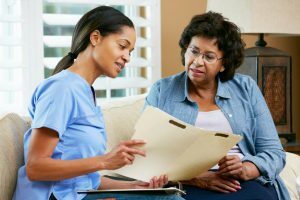 Once the referral is made, and authorized by your physician and the hospice’s medical director, a hospice nurse will visit your home to explain the program, and discuss a care plan to meet your specific needs. Remember, calling hospice isn’t giving up on your loved one. It’s getting help in the place where so many wish to be. Contact us now to learn more about our hospice home care services in South Jersey and how we can help keep you and your loved one at home.